If you can design it, the Bernina B 580 Sewing and Embroidery Machine can sew it! The B580 offers 935 stitches for you to choose from, including 284 decorative stitches, as well as, 100 different embroidery designs that you can customize by rotating, mirroring, or sizing up and down. You may also save your designs directly onto the B580 using the memory function. Bernina's 580 Sewing and Embroidery Machine provides an exclusive level of stitch control that you won't find on most other machines; adjust the stitch length and width, needle position, or even create your own custom combinations. Included with the B580 you also receive a Bernina Stitch Regulator that will help you master free-motion techniques by keeping straight or zigzag stitches consistent at variable sewing speeds. 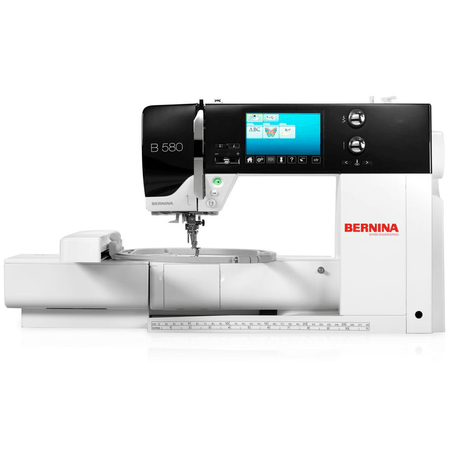 Enjoy all the user-friendly features and simple interface of the Bernina B 580 and get started sewing, quilting, or embroidering today! 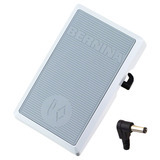 Bernina Stitch Regulator (BSR): The patented BSR is a high-tech presser foot that ensures top-quality stitching when free-motion quilting. When you sew or quilt with the BSR and lowered feed dogs, your stitch length will always remain the same, even if the fabric is not continually fed at a consistent speed. The BSR compensates for any inconsistency in speed, so that straight and zigzag stitches are always the same length. 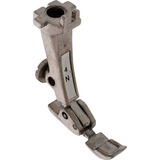 Free Hand System (FHS): The Free Hand System (knee-lifter) raises and lowers the presser foot while releasing thread tension and lowering the feed dogs, leaving your hands free to guide your project. This feature is especially ideal when sewing larger projects such as quilts. Stitches per Minute: Sew anywhere from 685 to 1000 stitches per minute on the B580. Depending on the complexity of your project determines the sewing speed. When embroidering your average speed tends to hover around the 685 mark, but when sewing or quilting your machine can reach up to 1000 stitches per minute. 935 Built-in Stitches: Never run out of stitches to choose from on the B580. Built-in are 935 stitches that include 284 decorative, 31 utility, 28 quilting, 12 one-step buttonholes, 7 alphabets, and many more. 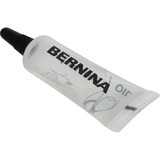 100 Built-in Embroidery Designs: Bernina's B580 Sewing and Embroidery machine include 100 built-in designs. Embroidery animals, decorative embellishments, flowers, lace patterns, baby items, seasonal images, borders, sports, letters, and more. 11 Needle Positions: Start your project at the precise spot by adjusting your needle position. Bernina's B580 allows you to choose from 11 different locations. Move your needle five places to the right or left or leave it in the center. LED Lighting: Never struggle to see when sewing on this machine. Twelve LED lights have been positioned around the needle to ensure you can see every stitch. Memory Functions: The individual setting options allow stitches to be altered or combined in a wide variety of ways to suit your project. The 580's 8MB of memory provides enough storage capacity to hold a large number of personal stitch combinations. One-Touch Buttons: The B580 includes multiple one-touch buttons that make operating your machine more accessible than ever. 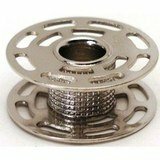 Located on the front of your sewing machine is a quick reverse button, start/stop button, automatic thread cutter button, a speed control slider, needle up/down, programmable pattern button, needle positions buttons, and stitch width and length buttons. High-Resolution Touch Screen: The High-Resolution Touch Screen on your B580 makes it easy to navigate through all the features of your machine. 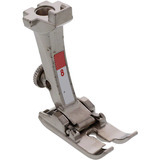 View your presser foot, stitch selection, needle position, thread tension, stitch length and width, and so much more. Edit stitches and patterns from this screen as well as adjust your settings to your ideal preference.